Photo taken in the late 19th century by Matthew Brady // via Wikimedia. 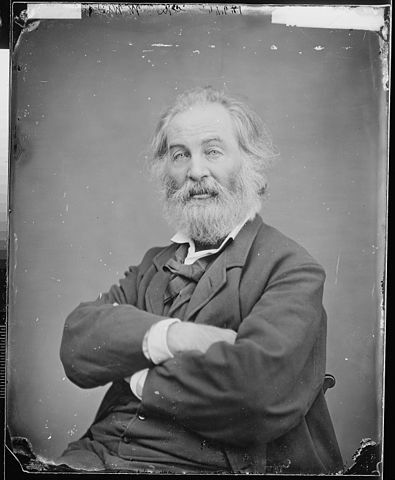 On May 31, 1819, Walt Whitman — the American poet, Civil War nurse, and eyes of New York City — was born. Whitman’s goal was to write an American epic, to unite people in one vision at a time when the country was fragmented. Still, his quirkiness shines through, even by today’s standards. When he first published “Leaves of Grass” in 1855, Whitman made no attribution to his name, but he had a portrait of himself on the front. He is an “American” poet not just for his place of birth, but for the sense of democracy that his poems create. His poems embrace conversation — with his readers, with strangers, with himself. He uses apostrophe, a literary technique, to speak to his own soul at times. He uses a capital S, like in the poem above. There’s something about the confidence in his words, and his need to reach out and touch. I’ve loved Whitman in all of his strangeness for a long time, because his poems make you feel that we’re all strange and in it together.